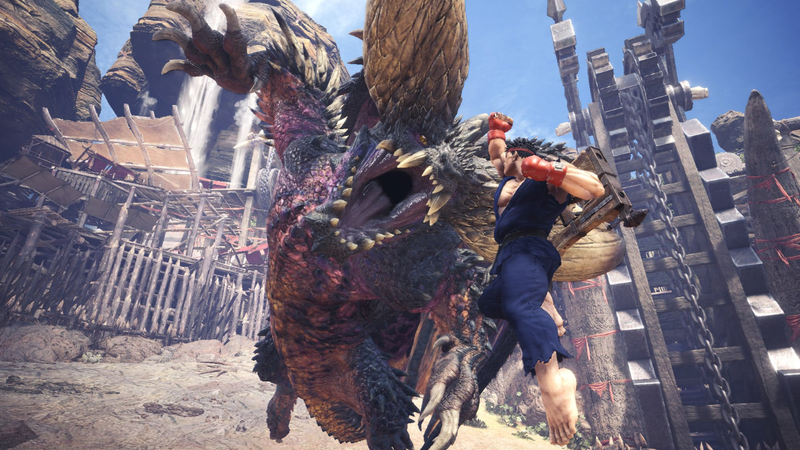 Monster Hunter: World’s Ryu armor was a silly trophy costume that was underpowered. The good news is that hunters looking to buff their gear can finally get an upgraded version. The bad news? You’ll have to fight one of the game’s most tenacious—and annoying—monsters. It’s really difficult. Like the recent Sakura quest, the game sets you up with powerful Max Potions and defense-granting Adamant Pills that help the early stages of the battle go smoothly. If you delay too long and your supplies dwindle, may God have mercy on you, because Nergigante won’t. This can be exciting: what better way to challenge your skills than facing one of the game’s most dangerous foes? But the lengthy fights turn this into more of a grind than it is probably worth in the long run. You fight the battle while wearing the new, better Ryu armor. If you win, you’ll earn tickets used at the blacksmith to craft it, but having to use it in the battle limits your options. You have to play by the perks and sats of that armor. You either commit to playing as Ryu or you just can’t do the challenge. Given the armor bonuses, I’m not sure if I’d want to keep playing as Ryu in the rest of the game. The gear acts as a Rathalos set, granting bonuses to critical hits and elemental attacks but it also features Lv. 2 Agitator and and Lv. 2 Constitution. That means you’ll get some extra defense when a monster is enraged. It’s not the worst mix up of traits but it feels underwhelming given the quest’s difficulty. These armor sets provide momentary bursts of silliness more than they offer practical alternatives to your normal loadouts. This quest is one tough monster hunt with a fun and marginally useful reward.It could be worse. You could be fighting Tempered Deviljho, the dangerous pickle-shaped dinosaur.